A complete comprehensive interactive dashboard. Accelo’s issues dashboard gives users an interactive, real-time dashboard and a complete overview of client services. This highlights issues that are in need of special attention such as stale issues, critical issues, unassigned issues, overdue issues and unallocated work. Easily click through to view more information on specific issues and follow up as required. The dashboard offers a complete overview of the number of issues created in that period, their frequency, the average time to resolve issues, the average number of days and hours between the issue being submitted and it being resolved, looking at the average (billable and non-billable) hours logged against those issues. 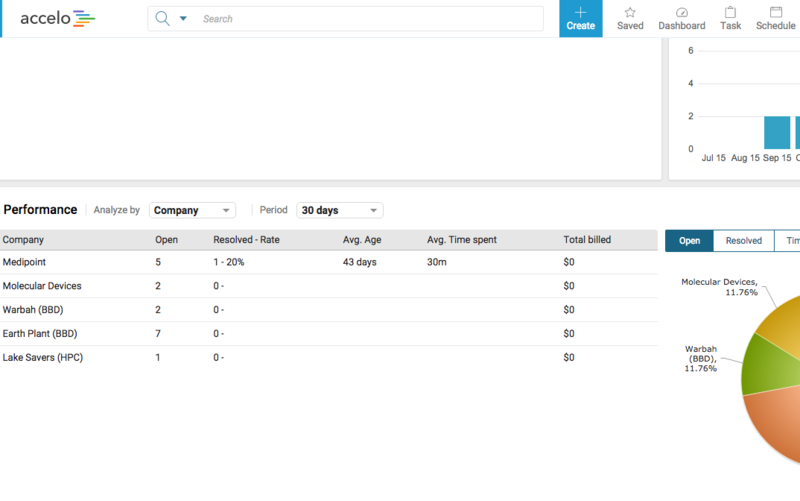 Managers can easily compare open tickets, select a period of time, view resolved issues, see the contracted rate, and compare against the number of open issues, average time, and total time billed. Provide a quick visual overview of the number of issues coming in each month, and get the insight you need in order to schedule your resources accordingly.